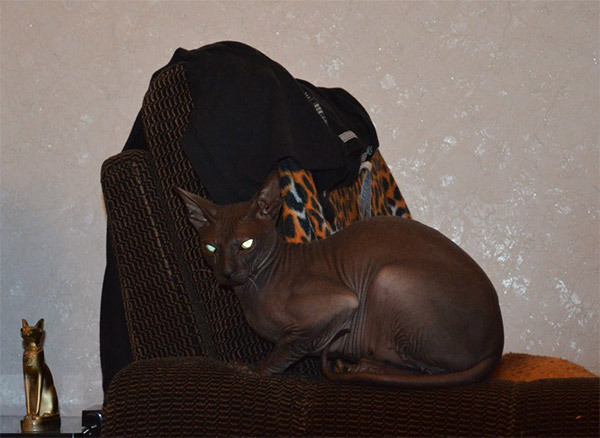 Black sphynx cat came to the United States back in the sixties from Europe and has become one of the most famous beloved cats of many people due to the fact that it is nearly hairless. The kittens play just like kittens with fur on them. They enjoy running and jumping around with the other kittens, and it is easy to find any skin disease since there is no fur to have to separate or comb or for any ticks or other bugs to get into. Caring for your black hairless cat is simple and easy to do and should start when the kitten is six weeks old. Keeping your cat healthy will lead to a long life of approximately fifteen to twenty years. Find a good veterinarian to make sure your cat receives adequate medical care. This cat enjoys being in doors, if you take your cat outside especially in the winter time, be sure to put some type of covering on their body. The covering should fit well, but not too tight for easy movement. With not having very much hair the cold can penetrate their body quickly and they will need the extra protection. A lighter weight covering should be used when the cat is outside during the hot weather. Their skin can become sunburned without this protection. Be sure to stay with your cat while it is outside and do not stay outside for very long, since this type of cat prefers to stay indoors. These cats love to take baths. 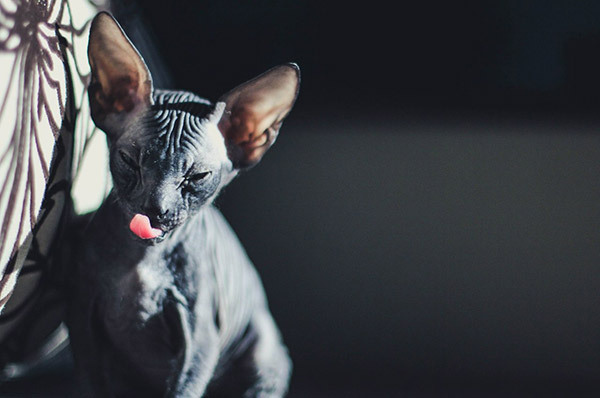 It is best to prepare your black sphynx cat for their bath with care. First run the bath water and allow your cat to watch everything that is being done. Keep the water temperature at a level that is not too hot or too cold. Put your cat in the water gradually as you continue to pet your cat. Take your time with the bath, this is a time your cat will enjoy as long as it is done correctly at least once a week. These cats do not have eyelashes like the furry cats do. The eyelashes help to keep dirt out of the eyes, so during the bath it is best to clean the eyes gently using a cotton ball washing from the inside to the outside. Since this type of cat enjoys being indoors it is best to keep their claws trimmed down. Trimming the claws is easier to do after they have been softened up in the bath water. A bath for your cat that is done on a regular basis will help to keep your cat healthy and happy. After the bath is completed dry your cat off with a soft towel and keep the towel wrapped around your cat for extra warmth until your cat is warm enough without the towel. This will help your cat from catching a cold. During and after the bath check your cat completely for anything unusual that you might need to report to the veterinarian. These cats can eat a considerable amount of good quality food throughout the day and stay active and are able to burn off the calories at a fast rate, and are not vulnerable to becoming overweight. These are very intelligent and like to stay clean and they want their litter box kept clean too. Keeping the litter box clean keeps down the smell and the cat or cats are more likely to use their litter box. One last thing about sphynx cats is that they do not enjoy being left alone. They are happiest when surrounded by many people and receiving the attention they enjoy so much. If you have to be gone have more then one cat so they can play with each other, and set up toys to keep your cat entertained. When you arrive back home take the time to play with your cats, so they stay healthy and happy. 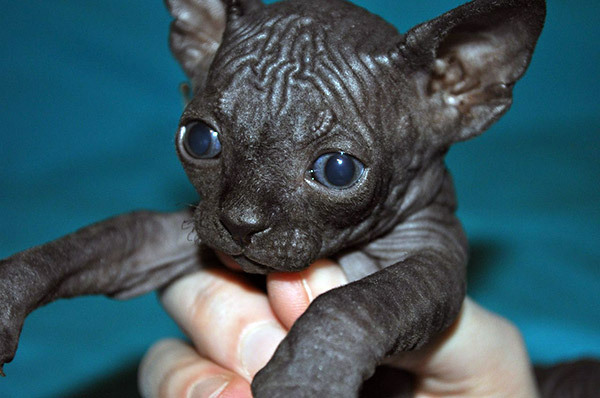 I didn’t know about black hairless cats! They look awesome! Especially small kittie on the last picture. Adorable!! !